My birthday is next month. Any fellow July babies reading? I'm not a big fan of summer (that's no secret), but I always enjoyed the fact that there was no school on my birthday. I have never been a big celebrator of my birthday, so I didn't usually have big shindigs and invite a lot of people. And as I age, I'm still very much the same. Some birthdays have been better than others and I don't mind making plans for a dinner with close friends and family or something simple. This year, that's probably the plan. A dinner out, a birthday date night with my husband, and just taking it easy. 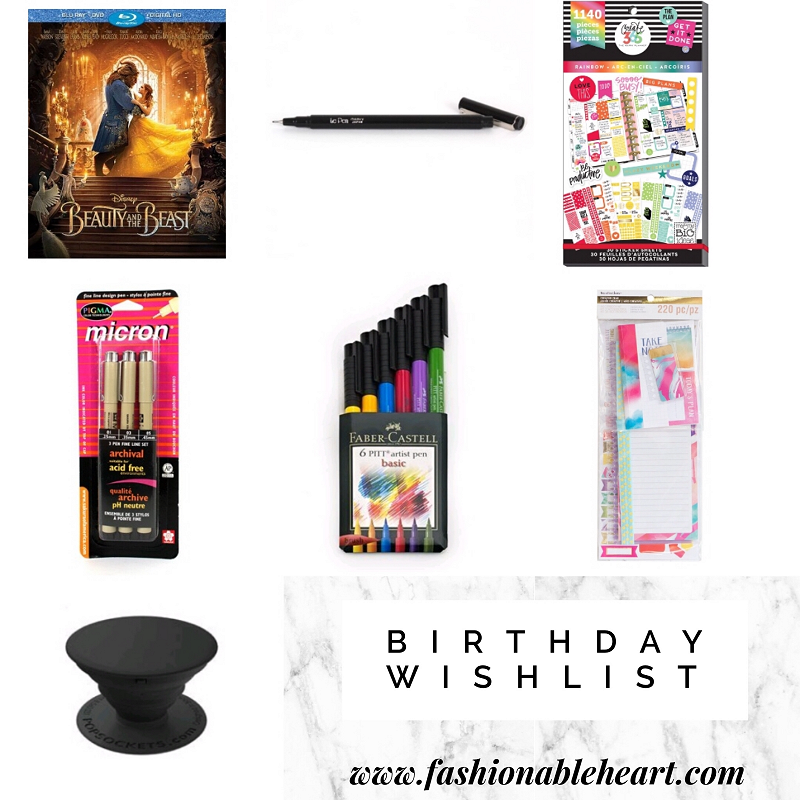 Are you a big celebration type of person on birthdays? I do have a few things that I wouldn't mind receiving as gifts. If you're here for beauty items, not this time. I've gotten quite a few new things in that category recently and want to take the time to enjoy those and get ready to review them. But don't think for a second that the Urban Decay Naked Heat palette is not going on my generic wishlist, just not on my birthday version! It's so dang pretty! Beauty and the Beast - I didn't get to see it while it was in theatres! At first, I wasn't excited for it. I don't care much for the live action versions of animated films. But it just looks so good from every clip I've seen and I adore Emma Watson. Le Pen - This list is mostly planner related things. Sorry if that bores you! I've been a planner person for the better part of my life. I just recently picked up two new planners at Michaels that I am really excited about (see below). I had a few Le Pens back in high school and enjoyed the fine tip. I never replaced them and I've since been seeing them pop up on my radar. So many colors, but I find black to be the most useful so I'll start there. Create 365 Sticker Book - This one is the rainbow one. I have four of their books in my collection so far and I am hooked. They last ages and I haven't even made a dent. These stickers are so great and versatile! I have a ban.do agenda right now and I make them work in the horizontal layout. Pigma Micron Pens - I haven't tried these, but I've heard they are brilliant. I thought they would be great for my bullet journal that I just started. Faber-Castell Pitt Artist Pens - Again, I want these for bullet journaling. Recollections Planner Accessories Kit - I love these little kits. They come with a band, sticky notes, a dashboard, bookmark, stencils, and sticker sheets. The dashboard, bookmark, and stencils are all cut to go on the coil. Recollections Recipe Planner - I recommend it to you if you love to cook and bake. I promise you do not have to be a planner type to enjoy this one. I've been putting some of the recipes from Pinterest in it so far. I have a few that I've tried and enjoyed and I'd really like them written elsewhere besides just saved on my account. Recollections Life is Sweet Planner - This is more for next year, though I'm breaking it in a little before that because it has a vertical layout that I am not used to. I was never attracted to vertical until recently, so we'll see. For now, I'm going to use it as my blog planner and test page layouts to see what works for me before it possibly becomes my main planner in 2018. If I don't make it my main planner, it will stay my blog planner and I'll go back to horizontal. I used coupons on both, which I highly recommend. 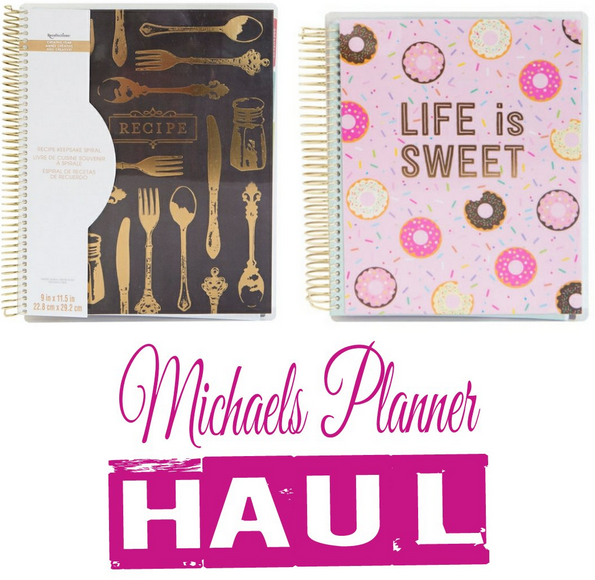 You can get a great planner and accessories and save a lot of money!